Bizzi Hands: Finally.. a card I hope you all like? As I said last night, I am missing my BFF as she has left Oz and headed to Paris. As I missed her birthday, I thought I would make her a card to send off with a care package so she doesn't miss us too much. 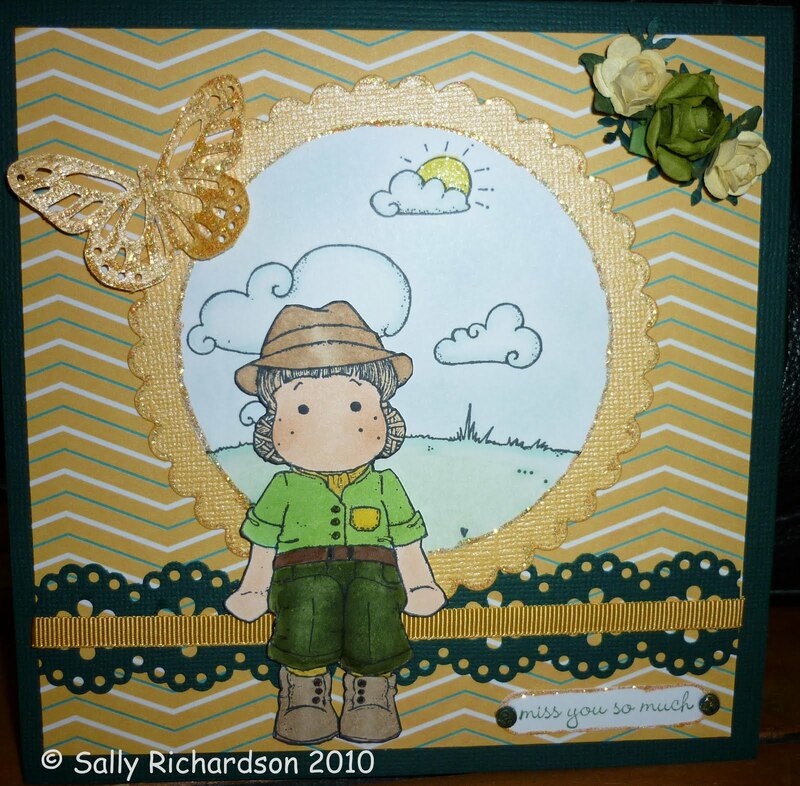 Paper: My memories, Flowers: Smudge & Sparkle, Punch: Martha Stewarts (butterfly and green lace, Spellbinders scalloped circle and plain circles, ribbon: Crafty Capers, buttons - who knows..lol. As I am still a newbie to all entering these creative challenges - I thought I would have a bash. this is a lovely card. thanks for joining in at Mad for Markers. Gorgeous card sally love the colours. Oh WOW this is BEAUTIFUL,love all the details and the fabulous Aussie feel to this!!! Oh and thanks for joining us at Bizzy Becs!! Oh that is beautiful and it definitely says "aussie"!! Your friend will love it I am sure!! Thanks for joining us at Mad for Markers!! Hi Sally thankyou so much for entering into my candy & thankyou for becoming a follower I really appreciate it. I have now become a follower of your fabulous blog. This Tilda card is gorgeous & I love the scene behind the image. Take care hun. What a great card! Perfect for Australia. Thanks for joining in our Mad for Marker's Australia Day Challenge! Hope to see you again on our next challenge. This is a great card... I love the colours you've used & your colouring is lovely with perfect highlights on his hat & pants.